Earlier this year we decided to experiment with planting a small, traditional-style milpa garden. A milpa is a plot of land planted with a number of different complementary food crops. This efficient agricultural technique was developed thousands of years ago in ancient Mesoamerica. It is still in use today in many areas of Mexico and Central America. We chose to plant the "Three Sisters" of Native American agriculture: corn (maize), beans, and squash. Corn and beans can be planted close together, saving space in the garden. The corn stalks provide a natural trellis for the beans to grow up. Corn and beans provide complementary amino acids, for a nutritionally complete diet. 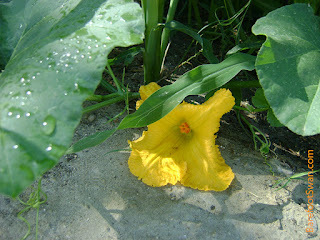 The squash were planted in between the rows of corn/beans. The low-growing squash plants help cut down on growth of weeds. 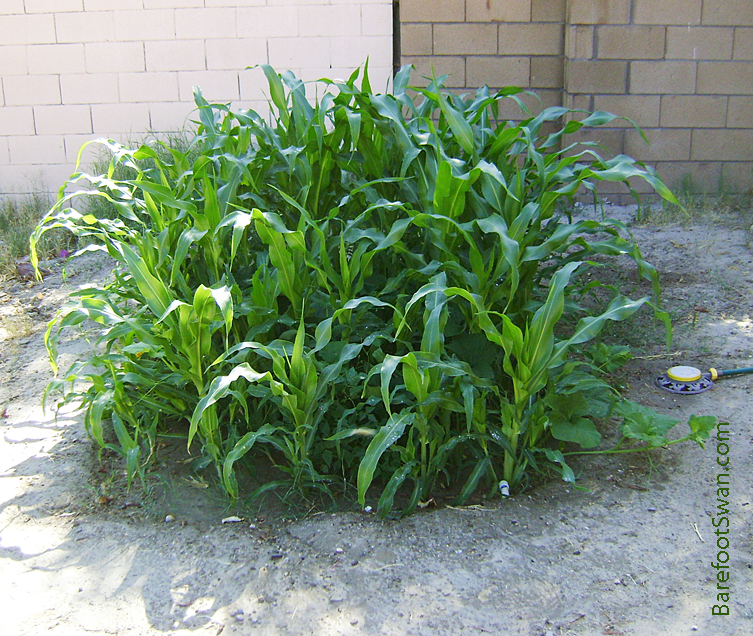 The taller corn provides cooling shade for the squash plants. The roots of the bean plant restore nitrogen to the soil. Our corn ripened about a month ago, just as the 120 degree weather hit. The ears got desiccated and we were not able to harvest fresh corn. So we left the ears to dry on the stalks, to eventually be ground into meal. 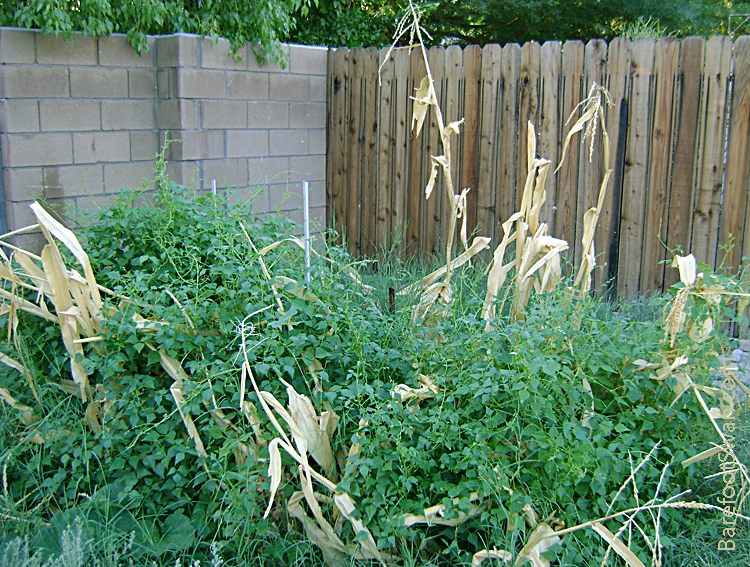 The dried corn stalks are providing a natural trellis for the climbing beans, which are just beginning to flower. 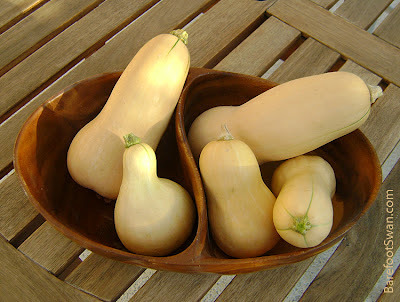 The squash was a different story. Protected in the shade of the corn stalks, there was enough squash for us and to share with friends. We have enjoyed it steamed, mixed into stir-fry, and as a delicious vegan soup. In the future we plan on experimenting with planting more heirloom and desert native varieties of traditional plants in our garden. The milpa "is one of the most successful inventions ever created." 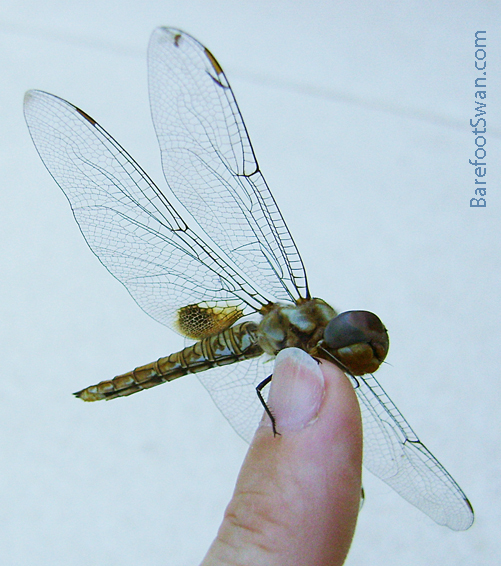 A couple of evenings ago, we found a dragonfly that had crash landed in our pool. We though we were too late when we fished it out of the water. It sat motionless in my hand for a few seconds, then grabbed onto my finger and fluttered its wings slightly. It was rather large, with a blue-ish green body and beautiful rusty brown markings on the hindwings. 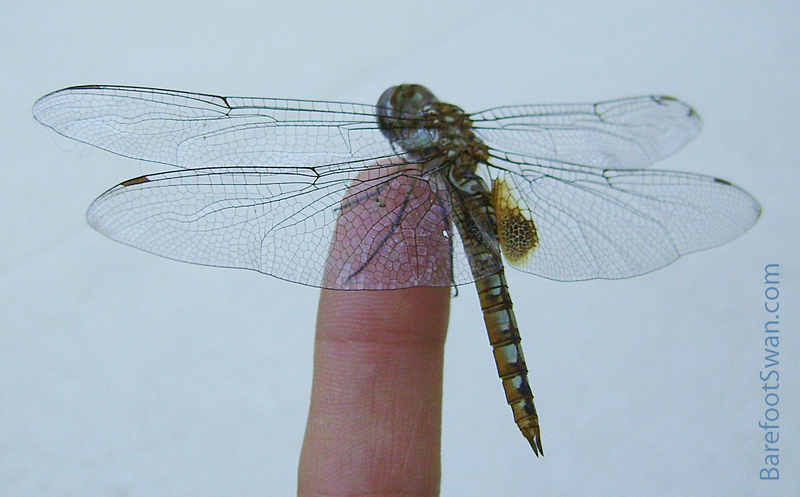 We were able to watch it for nearly 15 minutes as it perched calmly on my finger and dried itself off. It spent a lot of time running its front legs across its face and eyes, as it preened and recovered from the unexpected swim. 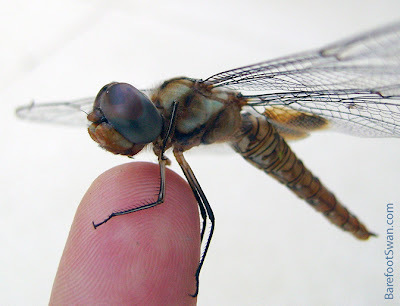 Dragonflies have been living on this planet for over 300 million years. Fossils dating back to the Carboniferous Period, reveal giant species with wingspans of up to 30 inches! Dragonflies are fast and agile flyers. Their wings are criss-crossed with multiple veins, which give them structure, shape and strength. Dragonflies are able to fly forwards, backwards, up, down and sideways, as well as hovering in place. Kind of like an insect version of a hummingbird! When you see an adult dragonfly, it has already lived most of its life. Mated females lay their eggs in wet areas. The eggs hatch into a nymph form which lives underwater. The nymph will molt many times as it grows in size, eating small aquatic invertebrates, fish and tadpoles. The underwater nymph form lasts from 2 months to 6 years (depending on species). For its final molt, the nymph crawls up out of the water. The old skin splits and the adult dragonfly emerges. The adult will only live another 5 or 6 months after this. If you have dragonflies in your yard, they will help by eating mosquitos, flies, gnats, wasps and other small insects. Dragonflies catch their meal in the air, aided by their keen vision. Their huge eyes cover most of their head. The eyes are compound and consist of nearly 30,000 individual elements. Over 3/4 of the dragonfly's brain is devoted to processing visual information. Their strong legs are covered with stiff hairs that help hold their prey. Dragonflies themselves are eaten by lizards, birds, fish, frogs, spiders and even other dragonflies. Their agility in flight and their huge eyes help them to avoid becoming someone elses' meal. I was looking for a safe perch to put this little guy, when it took off on its own. It hovered above my head for a few seconds before streaking off to chase a smaller dragonfly out of our back yard. A few minutes later it reappeared, chasing a hummingbird into a tree. "This dragonfly came up to me. He was hovering right in front of my face, and I was really examining him, thinking, How does he see me? I became enlightened." 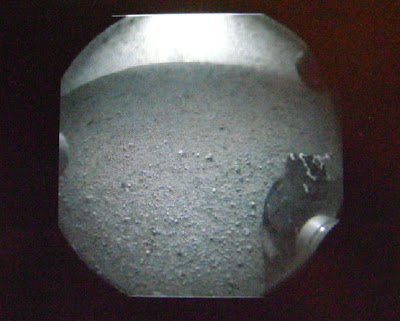 The rover Curiosity landed safely on Mars this evening, after an 8 month journey through space. NASA-TV provided a live feed from Jet Propulsion Laboratory in Pasadena, which we watched online. All of the complicated steps needed to land Curiosity safely on the Red Planet were orchestrated flawlessly. As each critical maneuver was accomplished, applause and cheers erupted from staff in the control room at JPL. NASA websites were overloaded by people trying to access the images online (including us). The United States now has two operational science rovers on Mars: newly-arrived Curiosity, and its much smaller cousin Opportunity - which landed on Mars 8 years ago and is still functioning! It is astounding to think that within minutes of safely landing a man-made craft on a different planet, we have these images available on our home computers. 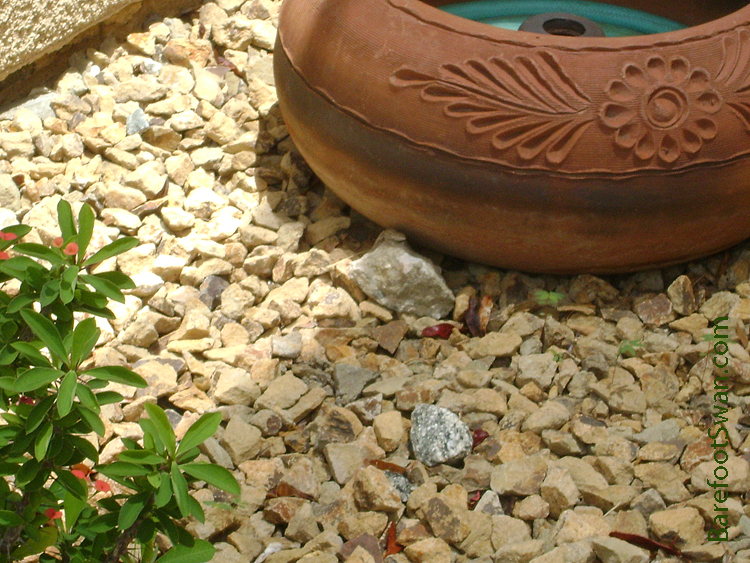 "7 Minutes of Terror: Curiosity Rover's Risky Mars Landing Video"
We have been seeing a new little lizard in our courtyard over the last couple weeks. Usually we just get a quick glimpse as he races across the sidewalk ahead of us, or darts into a clump of plants. A couple of days ago we found him sitting on a small rock by our hose storage pot. We probably would have missed him if we hadn't noticed his quick movements as he turned to check us out. I was able to get the camera for a couple of pics. 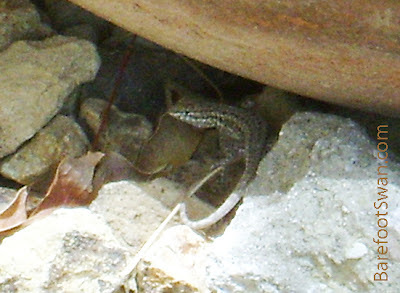 He really blended in well with the grey and tan rocks in our yard. 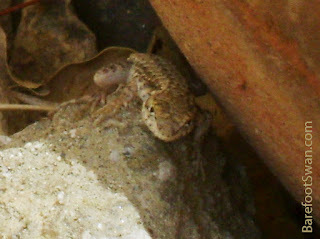 "Leapin' lizards, just look at this joint!"